Lovable Lunch Bag produces several sizes of lunch totes with some in multiple colors. 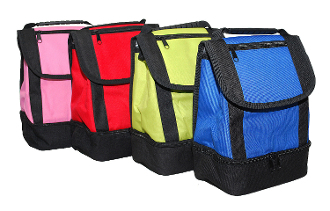 The flapover dual copartment lunch sack comes in lime green, pink, red, and royal blue. The flap includes a velcro fastner and zipper for additional storage. It has ample space for food, and a additional lower compartment with zipper for drinks, utensils, ice pack, etc. This particlar lunch tote has a side mesh holder for drinks or other items. This bag has it all and is great for everyday meals for everyone. Comes in multiple colors: lime green, pink, red, and royal blue. Includes carrying strap with durable handle. Zipper lower compartment for drinks, utensils, ice pack, etc. Main compartment storage size: 7" x 3" x 8". Bottom storage size: 8" x 4" x 2".